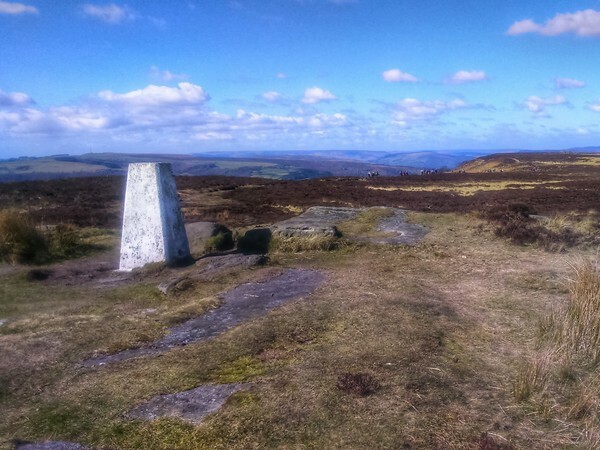 A full day guided walk as part of a small group of usually no more than six people plus your guide onto four of the gritstone edges that the Dark Peak area of the Peak District is famous for. Throughout the day, your friendly, professional guide will share with you a wealth of knowledge about the local history, geology, wildlife and plant life. From the village of Baslow we walk up the hillside onto White Edge with the heather covered Big Moor stretching away for miles in one direction, and far reaching views over the Derwent Valley in the other. Wild red deer are sometimes seen up here. 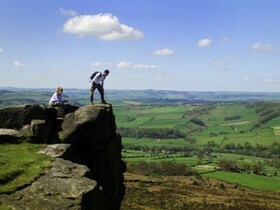 The route that we take to return to Baslow takes us along the scenic Froggatt Edge, Curbar Edge and Baslow Edge where we can marvel at the fascinating gritstone rock formations and enjoy further views over the Derwent Valley, and to the hills and moorland beyond. This walk is about 10 miles/16.2km with about 600 metres of ascent, on paths that can be rough and stony in places. 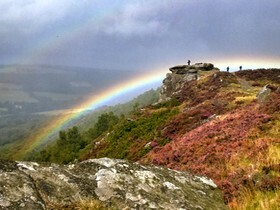 Southern Gritstone Edges Walk with Rachel Bolton. Sunday 16 June. We meet at 9:15am ready for a 9:30am start for the Gritstone Edges & Moorland guided walk in the Nether End car park at Baslow, Nether End. Post code is DE45 1SR. The car park is a 'pay & display' and costs £5.50 per day. You might be able to find free roadside car parking on nearby Eaton Hill. The Google map on this page that you can zoom in and out or marks the spot. Accessible by public transport by bus from some surrounding towns and villages. If you would like to stay locally the night before or after this walk, the villages of Baslow, Rowsley or Calver and the town of Bakewell are nearby. See our accommodation page for further information.